In my quest to buy a new 2016 car I discovered that the car companies are now using something in the cars that give me the same symtoms as airborne fiberglass. The salesman made an interesting observation. The cars that irritated my lungs had seats made out of artificial synthetic man-made material. 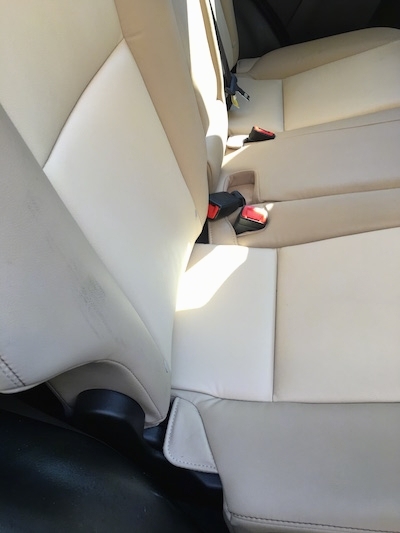 I could sit in the cars with cloth and genuine leather seats, but when a car with synthetic leather seats was baking in the sun the cabin air was so bad it was unbearable. I could not even put my head in the cars that had the fake leather for a second without what felt like a punch in the face of numb skin, burning raw sinus passages, raw throat, burning eyes, shortness of breath, and an ache in my chest. I would immediately reclose the car door. Even the cars with cloth and genuine leathers seats tended to have parts of the car such as the dashboard, arm rest, head rest, and side panels that contained synthetic leather, which explained why some of the cars seemed fine when in the showroom, but when the same type of car was baking in the sun it irritated my airways, as heat intensifies offgassing. The severity depended on how much synthetic material was in the particular car. The cars that had a "soft-touch surface" were really hard on my lungs even if the cars had real leather or cloth seats. The more cars with synthetic man-made material I poked my head into the more my chest ached and the more raw my nose and throat felt. The numbness remained until I went home and took a shower and changed my clothes, but the achy chest, and raw feeling in my airways remained for a couple of days. The feeling reminds me of the way it feels when one gets water up their nose in a swimming pool. I started testing all types of cars, even if I was not interested in buying them. Over and over again, the cars with synthetic leather seats had bad cabin air. They were sitting in the sun and most likely outgassing. The question is, what type of man-made material do they put in those synthetic leather seats? In my research to find out what could be in the new cars I found some of the car companies are using a glass fiber reinforced polypropylene (PP) which is used as a flame retardant. The incorporation of glass fibers in polypropylene is referred to as either glass reinforced or glass filled polypropylene. The flame retardant is added to the synthetic leather. The US federal government requires car companies to have fire proof properties, and after the last flame retardent Decabromodiphenyl Ether (DecaBDE) was thought to cause cancer, companies started searching for other ways. The soft-touch surfaces in some cars also contain polypropylene and glass fiber materials. 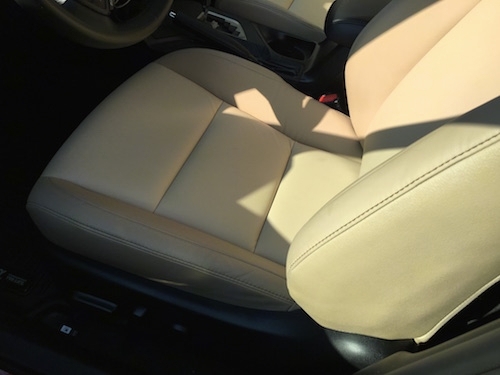 The bio-based glass fiber-reinforced polymer in the synthetic leather is not only being used in cars, but also in clothing, footwear, toys and accessories such as handbags and more, in the push to replace materials such as steel, wood, cloth and leather. The fact that the numbmess in my face does not go away until I take a shower and change my clothes, tells me that it is airborne and lands on the body, most likely in an outgassing form. I also discovered that a lot of cars have exposed fiberglass in the engines. It is already known that water and fiberglass do not mix. The glass fibers break down and off-gas at an accelerated rate when it comes into contact with moisture. Adding in the wind factor when one drives down the road and the combo is not a good one. Cars are exposing not only the occupants with airborne glass, but everyone else around the car. 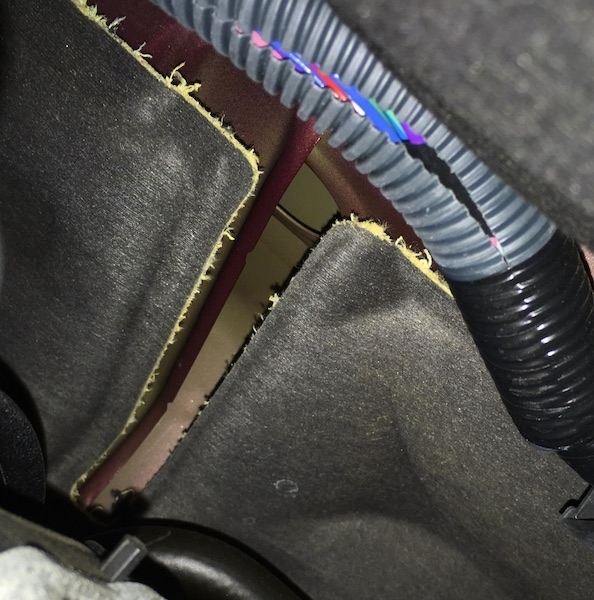 Exposed fiberglass in the engines of the cars could have also played a role in my reaction.